The BC regime is characterized by a simplified tax with a range of compensatory mechanisms, designed to make the tax “revenue-neutral.” The BC government has applied the tax across all economic sectors, collecting tax primarily at the wholesale or distribution level; while the RSA regime concentrates on the industrial-commercial sectors, imposing taxation on emissions from a specified list of activities and has developed a complex set of allowances to mitigate the burden of carbon taxation in the first phase of implementation—the purpose of the allowances being to achieve a soft landing of the tax for industrial sectors). In this article, we have provided a brief comparative description of these two regimes and the approach used by the relevant governments, and we have suggested some important lessons for the development of carbon taxation regimes in other countries. BC was the first jurisdiction in the world to implement a carbon tax, in 2007. From the outset, BC’s tax was meant to be “revenue-neutral”, in that individuals and entities affected by the tax would be compensated through reductions in other kinds of taxes, e.g. income and sales tax, or by compensatory grants. The price charged per tonne of carbon dioxide equivalent (tCO2e) was set to increase, from an initial rate of C$10 to C$30 in 2012. Critically, there has been no increase since 2012. The most significant characteristic of the BC carbon tax is that it is extracted at the wholesale point, i.e. it is levied against distributors of fossil fuels, not end-users (the exception to this is natural gas, which is taxed at the retail level). However, for purposes of making the tax as transparent as possible, government maintains an updated list of the actual cost of the tax as a fraction of the per-liter cost to the consumer. Of equal importance, government is responsible for tracking the revenue neutrality of the tax. This is done through a relatively simple exercise: the BC government estimates each year its expected carbon tax revenues for the next three years, and enacts tax cuts or other measures which should in principle reduce the tax burden on individuals and businesses by an equivalent amount. Although lower income tax rates do not in themselves indicate success, there is no doubt that the potentially adverse impacts of the carbon tax have been mitigated by good government policy, and that consumers have reacted to the tax by reducing their use of fossil fuels. Whether this shift is sufficient to offset the introduction of other emissions sources, e.g. large-scale Liquefied Natural Gas (“LNG”) developments, is a subject of much debate in the province. a phase one-specific additional 5 percent tax-free allowance for companies participating in the Department of Environmental Affairs carbon budgeting system (one aspect of a four-component mitigation policy). The potential net effect of tax-free exemptions is to reduce tax liability to between 60–95 percent of total emissions, i.e. 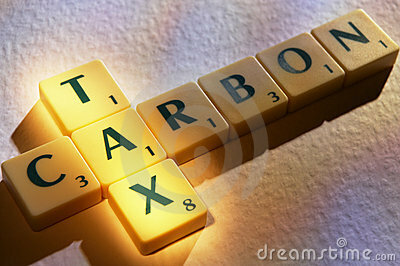 the carbon tax will be imposed on only 5–40 percent of actual emissions during the first phase. Although this may seem inadequate, given the country’s Paris pledge that emissions can be peaked by 2025 before plateauing for a decade and then declining in absolute terms from 2035, 5 South Africa has other means of reducing emissions including the above-noted carbon budgeting system and its well-regarded auction system for procuring renewable energy projects, 6 as well as its overall commitments to decarbonize electricity production. The regime also proposes that revenues from the tax will be spent on a range of sustainable interventions, e.g. providing tax relief for rooftop solar power, a reduction in the fossil fuel electricity levy or providing support for free basic electricity. The only significant similarity between the two regimes is the use of a single rate (Rand or C$/tonne) for all target groups, subject to change over time. Beyond that, the two systems are quite divergent. However, it should be noted that the tax rate in the SA regime is only a fraction of that in the BC regime: 120 Rand/t CO2e (US$8.50, C$11), before allowances are factored in; after allowances, the effective rate will vary from 6 Rand to 48 Rand/tCO2e (US$0.42 to US$3.49, C$4.50). The most distinctive feature of the BC regime is its relative simplicity. The tax is direct and uniform across sectors and classes, and is collected at the wholesale level for all fossil fuels, with the exception of natural gas. 7 The impacts differ according to the type of user and whether or not they qualify for tax deductions, tax credits, or targeted subsidies. The SA regime is far more complex, making it difficult to predict its probable impact. While it is intended in principle to be revenue-neutral, in practice it will be far more costly for emissions-intensive sectors, although during the initial phase this will be mitigated through the use of allowances. A further difference is the SA regime’s focus on commercial-industrial users, whereas the BC regime covers all classes of user. Because of strong negative feedback from business, the SA government has been forced to create its complex system of allowances primarily to avoid placing SA business at a disadvantage during a period of economic uncertainty. This also means that the SA regime has little direct impact on emissions in the transportation sector, a significant omission in that in South Africa, as in Canada, transportation is a major emissions source. By contrast, SA has developed a detailed offsets program, spelled out in the June 2016 document, Draft Regulations on Carbon offsets. 9 It is expected that carbon offsets will reduce tax liability by between 5–10 percent and that demand for offsets created by the tax has the potential to catalyze the local carbon market by sending firm supply, demand and price signals for locally-generated offsets.